Preheat the oven to 350F. Lightly grease a 9 tart pan with a removable bottom with coconut oil.In a mixing bowl, stir together all of the crust ingredients until they are all moistened and combined.Using a flat-bottomed measuring cup or your fingers, evenly press the coconut crust into the bottom and up sides of the prepared pan. Bake until golden and firm, about 10 minutes. Transfer to a wire rack to cool completely before filling with mousse. Place the finely chopped chocolate in a microwave-safe bowl and melt the chocolate until smooth - heat in 30 second increments, stirring in between, until the chocolate is completely smooth. Set aside to cool to room temperature.Once the melted chocolate has cooled down enough, combine the coconut cream, honey, cocoa powder, vanilla, salt and melted chocolate in the bowl of a food processor or high-powered blender (I used my Vitamix). Cover and blend until the ingredients are completely smooth and creamy, scraping down the sides once to make sure everything is full incorporated. The mousse will be thick enough to spread.Scrape the chocolate mousse into the cooled coconut crust and spread it out with an offset spatula, making an even layer.Top with fresh fruit, arranging as desired. To make the fresh fruit flowers, I watched and copied videos from Karen McLeans Instagram - heres the videos I watched for strawberries, kiwi, mangos, and nectarines. It is time consuming and it takes practice to figure out the technique, but it gets easier once you get the hang of it! 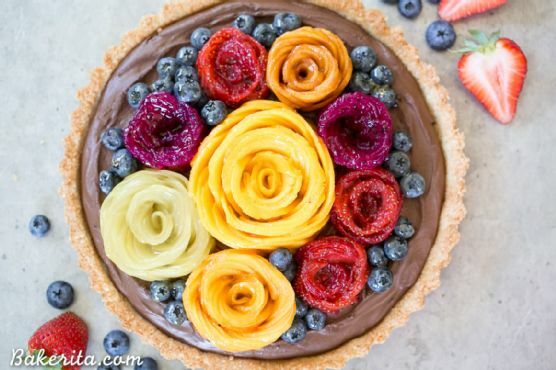 Obviously, you can choose to decorate however youd like!Refrigerate the tart for at least 2 hours before slicing and serving. Keep leftovers stored in the refrigerator. Tart works really well with Cream Sherry, Moscato d'Asti, and Port. A common wine pairing rule is to make sure your wine is sweeter than your food. Delicate desserts go well with Moscato d'Asti, nutty desserts with cream sherry, and caramel or chocolate desserts pair well with port.